Oma was not feeling well today. Not sure what was wrong . . . symptoms consisted solely of Oma being very tired! However, that does not mean that Oma could not continue with her “New Fruit a Day” Project. Since Oma was drained and not very hungry, a little creativeness was required. Luckily, Dole Frozen Strawberries reside in Oma’s freezer. Oma loves how the dark chocolate blends with the strawberry halves! Technically, the strawberry is an aggregate accessory fruit, meaning that the fleshy part is derived not from the plant's ovaries but from the receptacle that holds the ovaries. Nevertheless compared to fruits like apples, oranges or bananas, strawberries have the highest amount of nutrients. One cup of Strawberries contains only 54 calories. 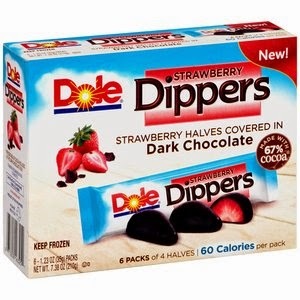 DOLE Strawberry Dippers are fresh frozen strawberry halves covered in dark chocolate. Each individual pack contains 4 halves, and are only 60 calories per pack! Oma simply pulled a pack from her freezer and enjoy her healthy fruit of the day!